So far all relativistically boosted jets with superluminal motion have only been detected in typical radio galaxies with early type host galaxies. 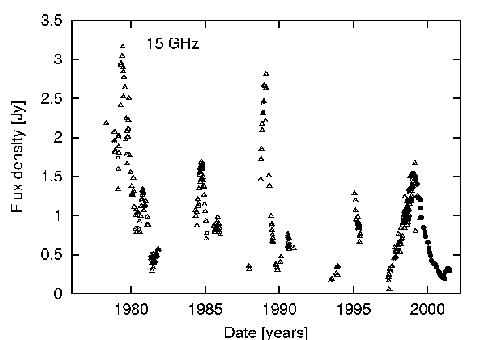 III Zw 2, a Seyfert I galaxy, shows dramatic radio outbursts roughly every five years (Fig. 1). Here we present the light curves and VLBA observations of the latest flare with an excellent time sampling. We have detected superluminal motion with a lower limit for the apparent expansion speed of 1.25+/-0.09c at 43 GHz (Fig. 2). Spectral and spatial evolution are closely linked and the evolution of III Zw 2 in a turnover frequency vs. linear size diagram is similar to the correlation for GPS and CSS sources. Before and after this rapid expansion we observe a period of virtually no expansion. However, at 15 GHz III Zw 2 shows a constant slow expansion (~0.6c). The difference is qualitatively explained by optical depth effects in an `inflating-balloon model', describing the evolution of radio lobes on an ultra-compact scale. The stop-and-go behaviour could be explained by a jet interacting with a molecular cloud or the molecular torus. Since III Zw 2 is also part of a sample of so called radio-intermediate quasars (RIQ), it confirms earlier predictions of superluminal motion for this source, based on the argument that RIQs could be relativistically boosted jets in radio-weak quasars and Seyfert galaxies. The results are also a good confirmation of synchrotron theory and equipartition for jets. Fig. 1: Long term radio light curve of III Zw 2 at 15 GHz. The triangles are from the Michigan monitoring program, while the circles are VLA observations. Fig. 2: Component separation at 43 GHz. III Zw 2 shows no expansion during the first three epochs at 43 GHz, followed by a period of rapid expansion with an apparent expansion speed of 1.25 c before the jet stops again.